I’ve had the stake truck home for a week and have been trying to get some miles on it around town to get the bugs worked out. In the process, I have been working on a few other wiring items, too. The first issue that I had was on Sunday night, I had decided to make a run to the store in it and as I backed out of the garage, the engine died. When I hit the button to re-start it, I heard a bang and the starter wouldn’t engage. Figured it was the bendix spring, but didn’t have time to mess with it until later. Add it to the list! I had a couple of days out of town, during the week, and finally made a call over to the guy that I was betting would have a “spare” spring. Jim Pike, here in Springfield, has a bunch of flathead goodies and hooked me up with a replacement spring. The “biggest” issue that I had was that my passenger side rear brake kept getting stuck, causing the brake fluid to heat up and expand, eventually locking up the brake. The only way to “unlock” it was to crack the bleeder valve and let off the excess pressure. Pretty dumb thing, but finally figured out what I had done that caused the issue. I had cranked down the lower adjusting pins too much, causing the shoes to have too much friction to let the springs pull them back to a “relaxed” position. Once I “un-snugged” them and backed off the upper adjusters a little bit, I quit having brake problems! I finally took time to finish connecting the horn. I had mounted it on the frame, but needed to run the wires from the horn button and the horn back to the panel, so that it could go through the relay. The last thing I got to, last night, was the gauge lights. In the process, I made my first wiring “uh-oh”. I wasn’t thinking and forgot to disconnect the battery, so when I unhooked the switch, I accidentally bumped the “hot” side against the dashboard, blowing the fuse. I guess one could consider that “testing” to make sure that the fuses work! Had to make another trip to the store and pick up some 20amp fuses and now my lights work again! Get new tail light brackets, so I can mount the passenger side light. 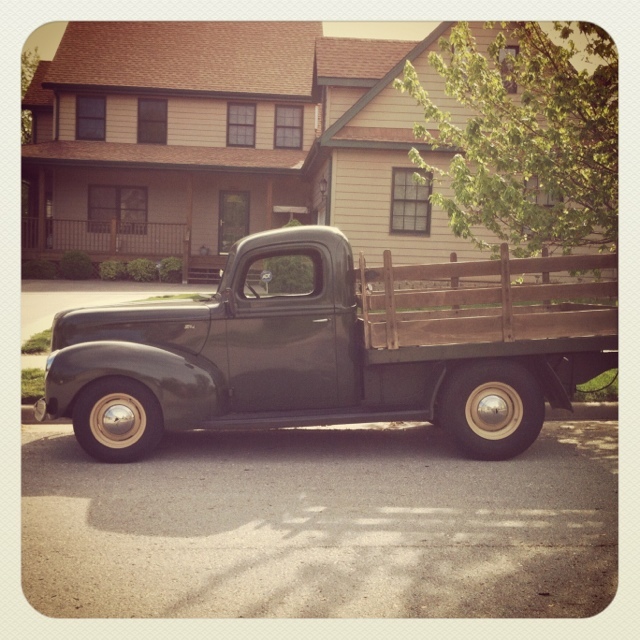 Make a run to Jeff City and transfer the title and register the YOM ’40 Truck tag. I’m planning on driving the stake bed this week to continue to work out bugs. Hopefully I will find some cool picture locations!